Has your Ansonia deck seen better days? Over time, the outdoor elements can take its toll on outdoor living spaces. Railings, stairs and decking get worn. Not only that, but cracks or breaks in footing boards can be dangerous. Although your deck may look like it’s nearing its end, the structure may still be sound and it good condition. For over 15 years, Larlin's Home Improvement has been renovating decks in Ansonia and making them look beautiful again. With each deck renovation project, Larlin's Home Improvement will inspect the existing deck to ensure any damaged areas are properly returned to their safe and usable condition. Our knowledgeable handyman will replace, repair and rebuild any loose, rotted or old boards, handrails, stairs and support posts. Looking to Install an Ansonia Deck? Having a deck to enjoy is one of the greatest additions to any home. It’s a great place for friends and family to gather for special occasions and increases the value of your biggest investment. 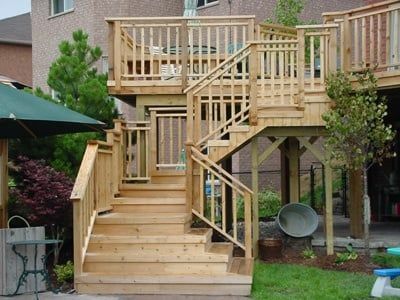 If you have been thinking of adding a new deck to your Ansonia home, the expert handymen at Larlin's Home Improvement can help! We have been installing decks in Ansonia for over 15 years and are well-versed in all ins and outs of the deck installation process. Since 2004, we have offered Ansonia deck installation services for a variety of Ansonia residents and understand each deck needs special attention. Whether you’re looking to install or renovate a wood deck, composite deck or combination deck, Larlin's Home Improvement will provide the best results. Call (203) 267-0607 for a FREE quote on enhancing your outdoor living space by installing or renovating your Ansonia deck!